Outset Scotland was excited to support the production of Joanne Tatham & Tom O’Sullivan’s A Glasgow Spectacular (or the experience being an experience like the experience you just had). 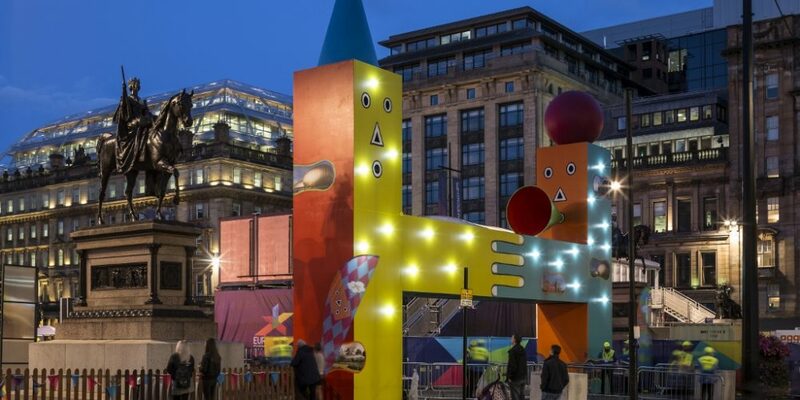 Festival 2018 – the cultural programme embedded within Glasgow 2018 European Championships – commissioned Tatham & O’Sullivan to create a temporary, large-scale gateway into Glasgow’s George Square, which functioned as the beating heart of the Festival. It was here that a host of free events took place, from the Great Big Opening Party on 1 August until the final day of the Championships on 12 August, and all attendees entered through the playful structure of A Glasgow Spectacular (or the experience being an experience like the experience you just had). Tatham & O’Sullivan’s commission adopted familiar and amusing motifs, which made specific reference to the context of Glasgow and the European Championships. After nightfall, the installation retained its dynamism and transformed into a sparkling beacon, thanks to the lighting incorporated into the sculpture. The motifs used on A Glasgow Spectacular (or the experience being an experience like the experience you just had) were also reworked by Tatham & O’Sullivan to create Festival 2018’s logo and brand, including the brochure, banners, flags, posters and stage backdrop. It was the first time in over twenty years that a contemporary work of art on that scale had been presented in George Square, making it a particularly significant commission. Tatham & O’Sullivan’s installation for Festival 2018 placed Glasgow’s reputation for world-class contemporary art centre stage, and this was further underlined by the fact that the artist duo met whilst studying at The Glasgow School of Art. Joanne Tatham (born 1971 in West Yorkshire) & Tom O’Sullivan (born 1967 in Norfolk) have worked together since 1995, after they met whilst studying the MFA at Glasgow School of Art. Tatham graduated with a PhD from the University of Leeds in 2004. Joanne Tatham & Tom O’Sullivan’s artworks often function as displacements or diversions which encompass sculpture, painting, architecture, photography, performance, literature, institutional critique and curation. They have exhibited with ATLAS Arts on North Uist and the Isle of Skye; Tramway, Glasgow; Kunsthaus Glarus, Switzerland; Studio Voltaire, London; and Eastside Projects, Birmingham. They represented Scotland at the 51st Venice Biennale in 2005 and were shortlisted for the Northern Art Prize in 2013. They are currently living and working in London and Newcastle. Festival 2018 was the cultural programme that formed part of the Glasgow 2018 European Championships. The Glasgow 2018 European Championships took place between 2 and 12 August and were the biggest sporting event in Scotland since the 2014 Commonwealth Games. Festival 2018 delivered a programme of world-class arts and cultural activity alongside the 11 days of sporting activities.